Tom Gillan, Gillan’s Custom Crafts, Atco, NJ. Order any book direct from Homestead and get it signed by Jeff! NEW January 2017! 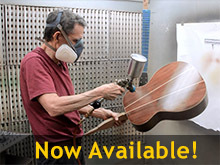 Finish an Acoustic Guitar (Online-Course & Download). Most people may not know that I started my woodworking/finishing career as a aspiring luthier. That didn’t quite work out but I’ve never lost my passion for making and finishing guitars. 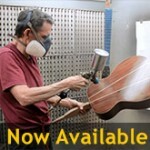 In this HD course filmed in my shop, I show you the complete process for finishing an OM style acoustic guitar with solvent spray lacquer. 3 hours of instruction shows you everything from surface preparation to buffing the finish to a brilliant gloss. I’ll share all my tips, and troubleshooting along the way. Available only through Robbie O’Briens On-line course site here. Troubleshooting – lacquer drop fills, stick shellac, rub-throughs. NEW! 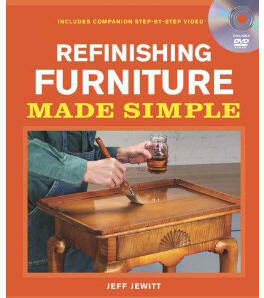 Refinishing Furniture Made Simple (Softcover Book & DVD set). Old furniture, whether a treasured heirloom or consignment shop find, is often better made than anything that can be bought today. So, why let damaged finishes detract from a beautiful piece when you can repair or refinish it in a way that preserves the piece and makes it look as good as new? Author Jeff Jewitt, a professional refinisher with over 30 years experience, shares his tricks, shortcuts, and tools of the trade in Refinishing Furniture Made Simple, an easy-to-follow book/DVD set by the Taunton Press that is sure to fly off the shelves. Weekend refinishers as well as professional woodworkers will benefit from the insider tips on how to evaluate the condition of a piece to decide the best strategy for rejuvenating it, repair and revive finishes to enhance their beauty while preserving their patina, and match an old finish for a seamless look. Order from Homestead and get your copy signed! Spray Finishing Made Simple – This project is a new concept in book publishing, combining a feature and technique packed 45 minute DVD with a 125 page companion book. 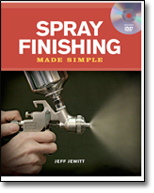 In this book and DVD, Jeff explains how to choose equipment, how to set it up and demystifies the entire spray-finishing process. 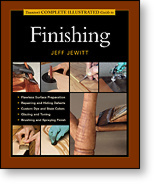 Published by Taunton Press, the book, “Complete Illustrated Guide to Finishing” has over 300 pages and 800 color photos and is the most up-to-date, comprehensive book on finishing wood ever published. 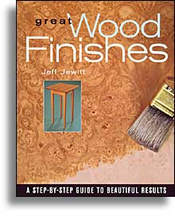 This book covers both tried and true techniques like French Polishing right alongside more modern techniques such as spraying polyester and conversion varnish. You’ll learn about all the latest products and the tools to apply them, and techniques like toning, shading, sun-bursting, creative grain filling, and applying finishes, both by hand as well as spray. The book is organized for quick access which makes it easy to find each technique or topic. From the Introduction by the author “Finishing. It’s the aptly named final detail to making furniture. Finishes not only protect wood from stains, water damage and other mishaps, they also make it look richer, deeper and add dimension and luster. For me, finishing is the most enjoyable part of working wood, because it’s where everything comes together. Whether it’s the tingly feeling from wiping a coat of oil or shellac on highly figured curly maple or the excitement from matching an old finish, finishing is the reward of making things from wood. Yet I’ll wager that for most of you finishing isn’t fun or has been an unpleasant experience. Sadly, most woodworkers find out the hard way that Murphy’s Law’s of everything that could possibly go wrong begins with the introduction of a finish to wood. Just think of the phrases used to describe finishing problems: “fish-eyes”, “wrinkling”, “splotching”, “bleeding” or “orange-peel”. You want that on your furniture? This book was designed to make finishing easy. In this book you’ll get pro-level advise presented in a clear and concise format with plenty of clear, four-color photographs. You’ll get advice on the best equipment to buy, and then you’ll be shown how to use it. Included are helpful hints on each page to avoid the most common pitfalls and troubleshooting charts. The heart of this book is the Specialty Finishes Section, in which 14 finishes are detailed in a step-by-step format. Spray finishes right — the first time!! Also learn how to choose and use spray equipment, build and set up a portable spray booth. Matching finishes, using glazes, toning and shading are discussed in detail. All finishes are done using commonly available finishing products. Author comments “This book is the culmination of what I thought the perfect finishing book should be. Written and photographed over a two year period, we took 14 pieces of unfinished furniture and my photographer Randy took photos while I finished these pieces. There’s no trick photography, no studio or posed shots. We worked on real furniture in real settings similar to those that amateur and novice woodworkers would have. Randy puts you over my shoulder and in the front row so you can see the nuances of coloring, finishing and rubbing out this furniture. It’s as close as you can get to private instruction”. The Hand-Applied Finishes DVD combines the two videos, Coloring Wood and Applying Topcoats that were originally released as separate tapes as a companion to Hand Applied Finishes in 1997. Applying Topcoats won the Golden Hammer that year for Best How-To Video. 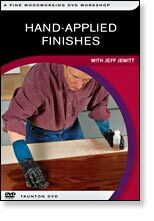 In this 80 minute jam-packed DVD you will learn the complete finishing process, from preparing the wood to rubbing out the finish and doing minor repairs. Learn how to French Polish, use stains and glazes, brush different finishes and much more. Every major topic in Finishing is covered and there’s no other video like on the market. It’s like taking a 2 day seminar from Jeff and paying less than 20.00.